1 : 21600 Martenet, Simon J. 1 : 23500 Colton, G.W. from The American traveller ; or, Guide through the United States, containing brief notices of the several states, cities, principal towns, canals and rail roads, etc. ; with tables of distances by stage, canal and steam boat routes ... by H.S. Tanner. 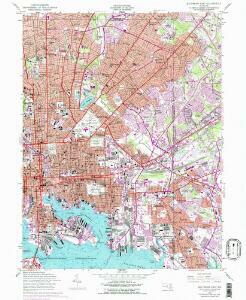 Map of the city of Baltimore. L. Prang & Co.
Road from Philadelphia to Washington. (Maps) 16, 17 and 18. 1 : 63360 Moore, S.S.
1 : 20000 Martenet, Simon J.